Microsoft has launched its own tablet called Microsoft Surface in an attempt to overtake competitor and partner Apple, and rival Google. 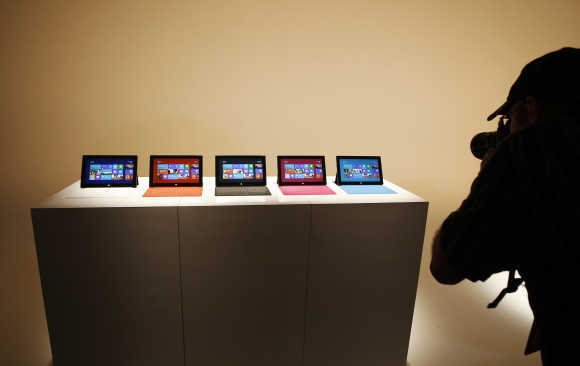 The company unveiled two editions - Surface for Windows RT and Surface for Windows 8 Pro - in Los Angeles, California, on Monday night. 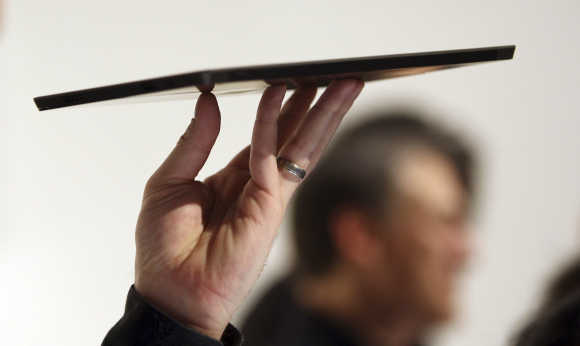 Let's take a look at the tablet launched by Microsoft. 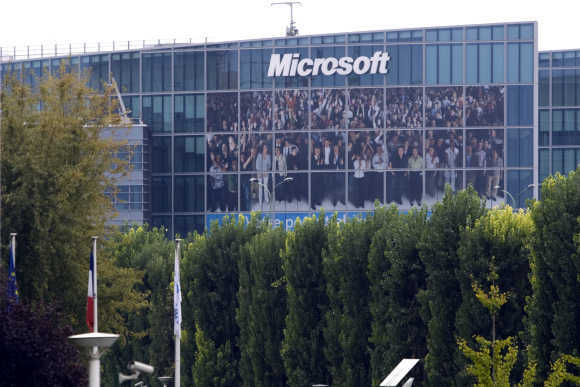 Image: A view of the Microsoft's headquarters in Issy-les-Moulineaux, near Paris. Surface is thin, light and it has a great battery. At 9.3mm, Surface for Windows RT is just thin enough to still sport a full sized USB port. Print, share, or charge your phone on the go. 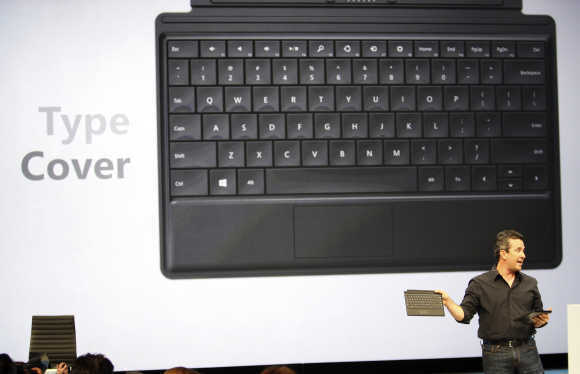 Image: Microsoft's Corporate Vice-President of Windows Planning, Hardware and PC Ecosystem, Michael Angiulo, holds the Surface tablet computer and keyboard during his presentation as it is unveiled in Los Angeles, California. Surface has a 10.6", 16:9 widescreen HD Display. Microsoft's ClearType HD Display technology delivers a great picture for movies. 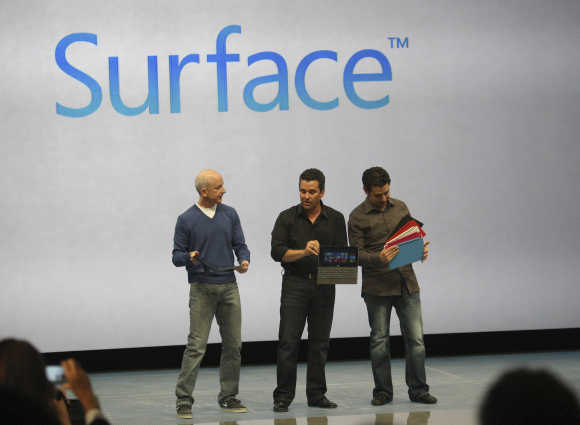 Image: Microsoft representatives hold the Surface tablet computer as it is unveiled in Los Angeles. An ultra-wide viewing angle makes it easy for your friends to share in the vibrant experience. 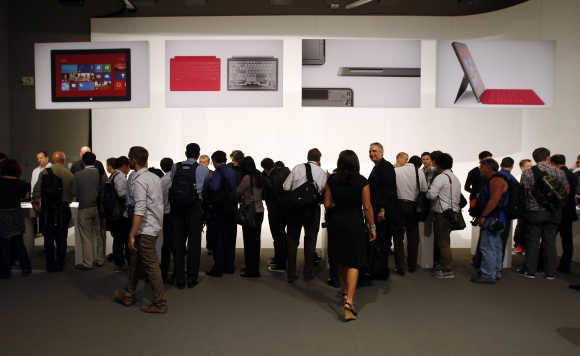 Image: Surface tablet computers with keyboards are displayed at its unveiling in Los Angeles. The auto-adjusting screen intensity delivers great visual clarity, indoors and out. 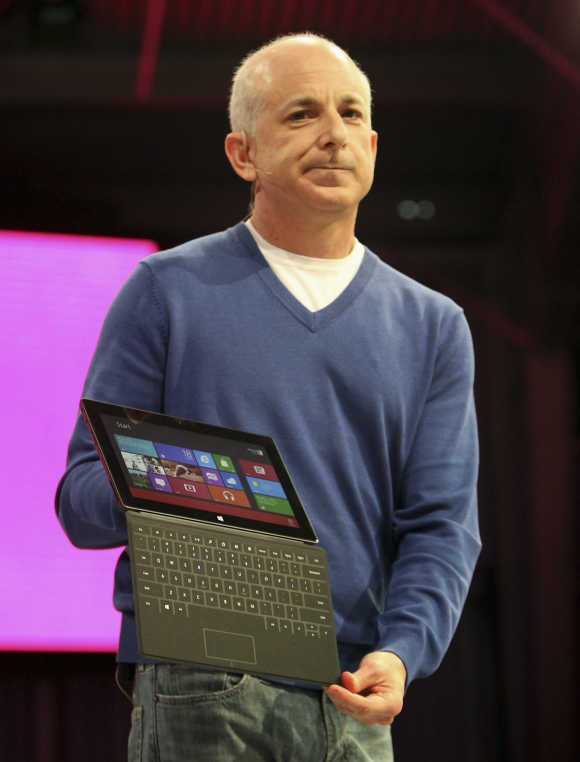 Image: President of the the Windows and Windows Live Division, Steven Sinofsky, holds the Surface tablet computer during his presentation as it is unveiled in Los Angeles, California. The addition of the Micro SD card slot means you can bring your entire movie and music collection with you on vacation. 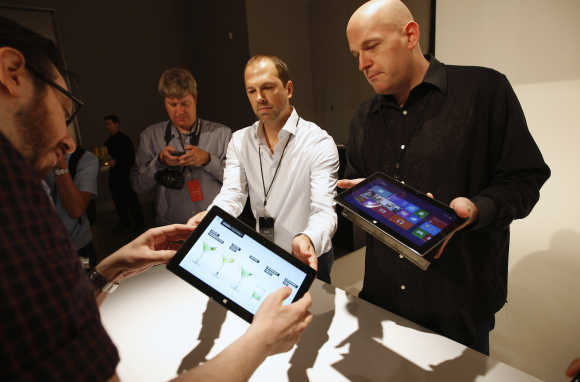 Image: Microsoft representatives show the Surface tablet computer to members of the media in Los Angeles, California. Some activities call for a keyboard. Surface comes with an integrated Kickstand and a revolutionary, 3mm thin, pressure sensitive cover that doubles as a fully functioning keyboard and trackpad. 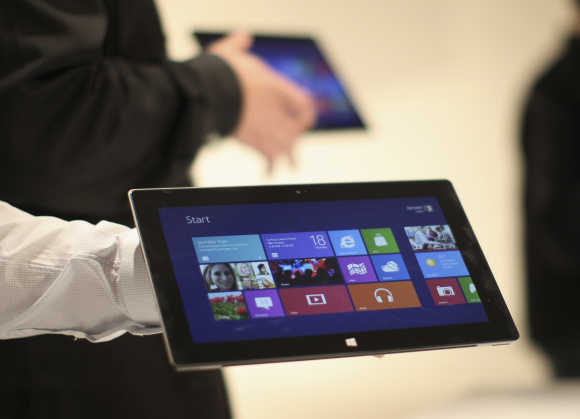 Image: A Microsoft representative holds the Surface tablet computer in Los Angeles, California. Your Touch Cover connects to your Surface with a single magnetic click. Image: A Microsoft representative scrolls the screen of the Surface tablet computer in Los Angeles, California. Now you can chat with friends and respond to emails comfortably. Image: The Surface tablet computer by Microsoft is displayed in Los Angeles, California. Surface has not just one, but two cameras. Use the front LifeCam to chat with the people that you care about. 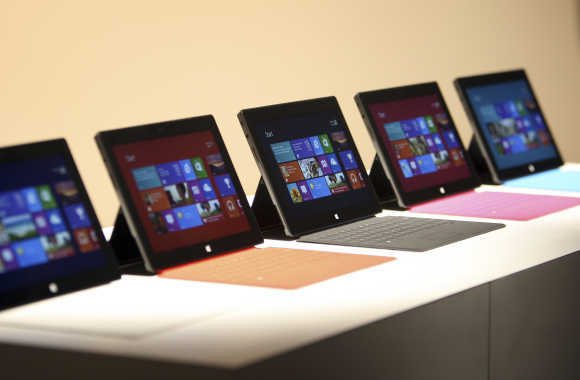 Image: Members of the media get a quick look at the Surface tablet computer in Los Angeles, California. The rear-facing LifeCam is angled to 22 degrees so you can flip out the Kickstand and record meetings and events hands-free. 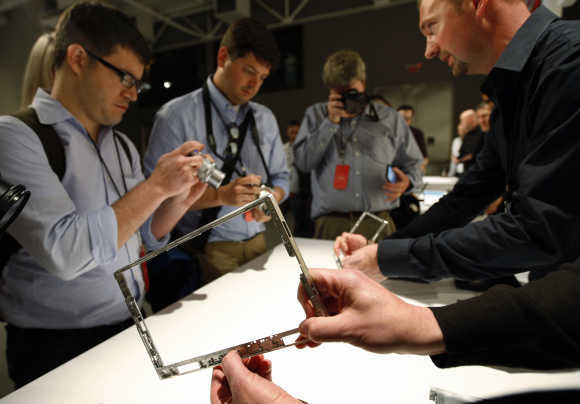 Image: Microsoft representatives show the chassis of the Surface tablet computer to members of the media in Los Angeles. Stereo speakers and dual microphones tuned for Skype help you sound like you are right next door. 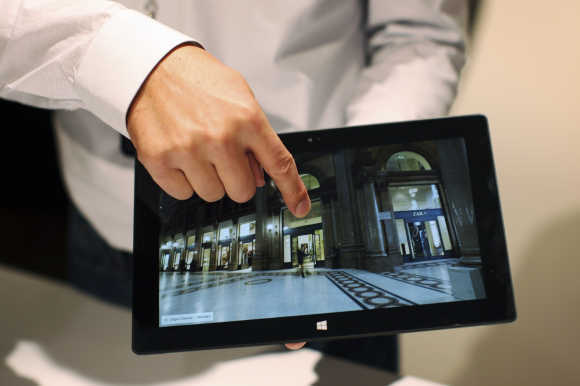 Image: A photographer takes pictures of the Surface tablet computers on display in Los Angeles, California. Surface was designed to be your go-to-device. It comes with a precision crafted VaporMg casing that protects the vital technology inside and leaves a high quality finish and feel. 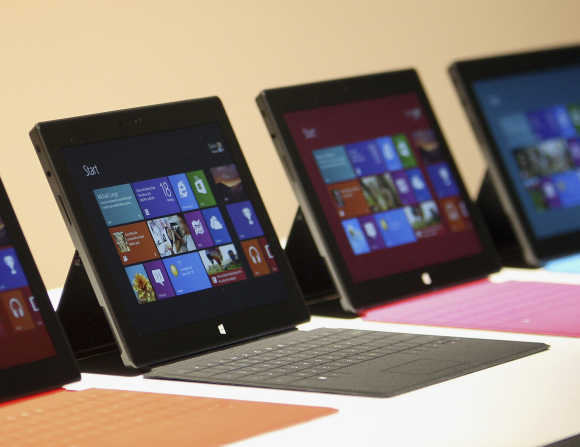 Image: Surface tablet computers are displayed in Los Angeles, California. Touch Cover comes in five vibrant colours. Type Cover offers classic typing experience for those who prefer a more traditional keyboard. 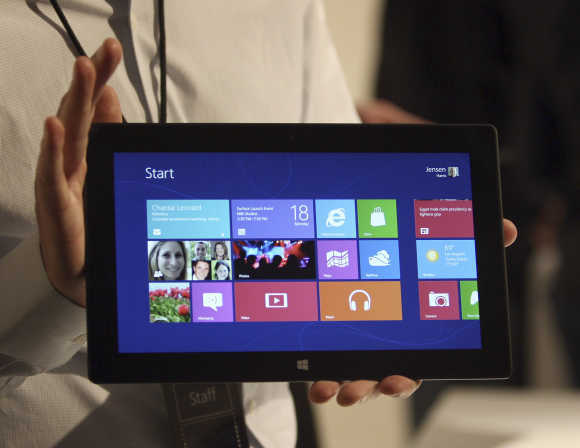 Image: A Microsoft representative holds the Surface tablet in Los Angeles, California. Pick the one that best meets your needs and represents your sense of style. 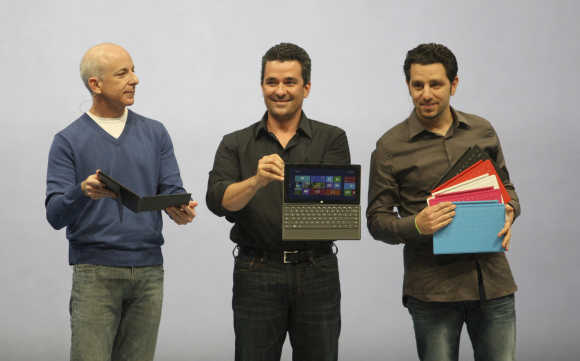 Image: President of the Windows and Windows Live Division Steven Sinofsky, left; Corporate Vice-President of Windows Planning, Hardware and PC Ecosystem, Michael Angiulo; and GM of Microsoft Surface Panos Panay, right, hold the Surface tablet as it is unveiled in Los Angeles, California. 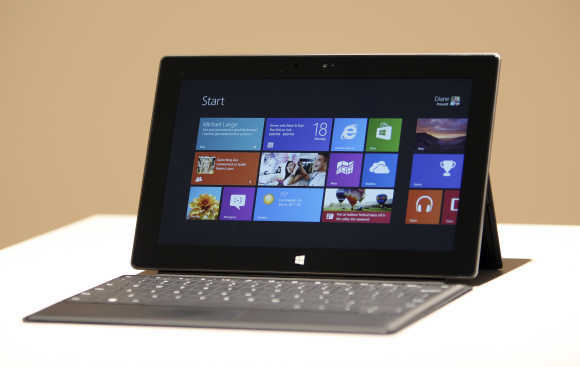 The Surface tablets feature 10.6-inch touch-screens wrapped in a magnesium case that Microsoft calls VaporMg. The distinctive feature of the tablets is a magnetically-attached, 3mm-thich Touch Cover that folds down and functions as a full touchscreen keyboard. ix) Front and rear-facing HD cameras. 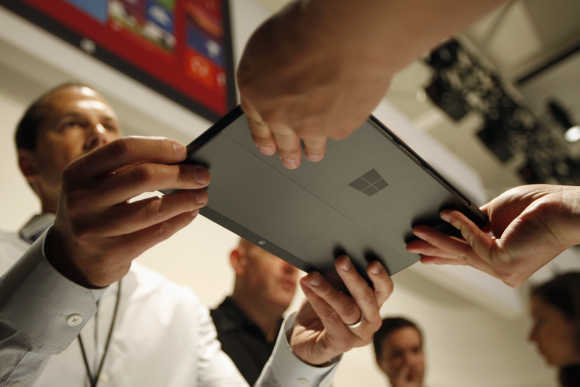 Image: Microsoft representative hands the Surface tablet to a member of the press in Los Angeles, California. 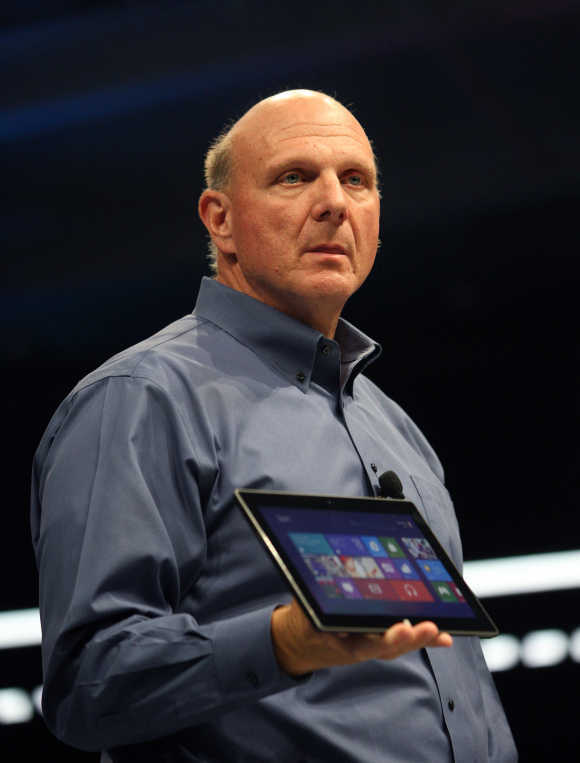 Image: Microsoft CEO Steve Ballmer holds the Surface tablet in Los Angeles, California.